Now we have nothing against Lieutenant Governor Anthony Brown, so save the emails. But keep in mind that in Maryland the Lieutenant Governor's duties are set by the Governor. And what did the Governor have the Lieutenant Governor do a couple weeks ago? BALTIMORE, MD (November 12, 2008) -- Lt. Governor Anthony G. Brown today joined state employees in a celebration of the new state exercise of walking by leading a group of walkers around the State Office Complex near Baltimore’s cultural arts district. The event is sponsored by the Department of Health and Mental Hygiene (DHMH) and is designed to draw attention to the University of Maryland’s Get Fit Maryland, a 12-week pedometer-based walking program. Are you guys sure you really want this job? You have committed an unthinkable act. You have actually looked at a political blog on Thanksgiving. And now you are Busted! That’s right, you are more cooked than that turkey you’ve been burning. An automatic email has been sent alerting your significant other. Your cable reception will crash. Your beer fridge will short out. And your wicked Uncle Ernie will now stay an extra hour, torturing you with the latest tales of his stuffed fish collection. So eat that extra drumstick (and that extra cookie, and that extra slice of pumpkin pie, and… well, you get the idea). Tolerate Uncle Ernie. He only comes down once a year and he has no one who listens to him except you. Root for Seattle to upset Dallas like the rest of us will. And come back next week because there will be plenty of politics then. But don’t come back tomorrow. If you do, Uncle Ernie will move in for good! After my last post about Chris Van Hollen, it was suggested to me that the reason Van Hollen could not be in the elected leadership of the House Democrats was because Steny Hoyer was already there. Between the Majority Leader representing Maryland and Nancy Pelosi being born here, I was told that Maryland is already heavily represented in the House leadership. It is true that with Steny Hoyer as Majority Leader and the native Pelosi as Speaker, Maryland seems to be doing well in the Congressional leadership ranks. Have we always had such luck? The only House of Representatives leadership position mentioned in the Constitution is the Speaker. It is the only leadership position elected by the entire House. The parties tend to unite around one candidate so that whoever wins within the majority party will become Speaker. Maryland is one of four of the original thirteen states to never have a Speaker representing the state. It is nice that Nancy Pelosi is from Baltimore, but last I checked C-SPAN lists her as (D-CA). We are joined by Rhode Island, Delaware, and New Hampshire in the lackluster category of fighting the revolution and not having a Speaker of the House. After the Speaker, the other members of the House leadership are elected within their own parties. The top leadership structure of the Democratic Caucus and Republican Conference are the same. Each party has a Leader, known as the Majority or Minority Leader depending on the party’s status, a Whip, a Chair, and a Vice Chair. Maryland has not fared well in House leadership. The only Leader or Whip, positions that first came about in the late 1890s, Maryland has ever had is Steny Hoyer. There has never been anyone else in any of the top leadership posts representing Maryland. Pelosi served as Minority Leader and Whip as well, but again, she was representing California in Congress. We have fared only slightly better in the Senate. The posts we know of today as Majority and Minority Leader of the Senate, the top leadership posts, developed in the 1920s. No one from Maryland has ever held the position. Party Whips, the second ranking member of each party in the Senate, actually came about a decade earlier than the leader position. Unfortunately, Maryland has never had one of those either. Senate President Pro Tempore is the only Senate leadership position listed in the Constitution. The original purpose of the office was to preside over the Senate when the Vice President was away. In the nation’s early years, the Senate President Pro Tempore was picked each time the Vice President was away, so there could be many different Senate Presidents during a single year. In 1890, the Senate began electing Senate Presidents for an entire Congress. Since World War II, it has largely been an honorific position given to the longest serving member of the majority party. Maryland has had a little luck with this job. John Howard held the post for six days back in November of 1800. Samuel Smith held it for thirteen days in December of 1805. Both Howard and Smith were Senators from Maryland. Perhaps Chris Van Hollen’s non-Maryland colleagues in the House disagree, but when I hear that our Congressman cannot move up in the House leadership because there are too many Marylanders running the House, my Maryland pride stirs up and I say it is about time! In Part Two, we described Oregon Governor Ted Kulongoski’s aggressive infrastructure bill to create jobs, stimulate the state’s economy and generate long-run returns for Oregon. So what about Maryland? No one argues that Maryland’s transportation needs are immense. And according to MDOT Secretary John Porcari, the $400 million increase approved in the 2007 special session is only now yielding $265 million, just barely enough to keep up with system preservation needs. Put aside the obvious need for specific projects like the state’s three proposed transit lines and the BRAC projects in Bethesda, Aberdeen and Fort Meade. There are four reasons why Maryland’s political leaders must heed the example of Oregon and start putting more money into transportation now. Many large projects that rely on federal financing require matching funds from state government. That is especially true of Baltimore’s Red Line and the Washington suburbs’ Purple Line and Corridor Cities Transitway. Unless Maryland demonstrates an ability to raise sufficient funds to pay its share of these projects, federal money will flow elsewhere. At present, we are deferring $1.1 billion in new transportation projects and face the possibility of delaying $2.5 billion more. It is inevitable that delayed projects will see higher construction costs if they are started years in the future. That will be especially true if petroleum costs rise again and ripple through into construction materials. And recessions are good times to build construction projects because contractors are hungry for work and will restrain their margins just to keep their key personnel employed. The Tax Foundation’s determination that Maryland’s business tax climate has deteriorated from 24th to 45th among U.S. states in one year is a threat to the state’s reputation. If in addition the state is perceived as unable to finance its transportation infrastructure, it will risk being perceived as a radioactive place for locating jobs. Governor O’Malley has done his best to deal with a difficult budget situation. But if the economy is still in rough shape in 2010, that may be insufficient to mollify voters. What voters want in tough times is to create jobs – especially high-paying jobs. The construction industry creates and supports many high-wage jobs such as estimators, engineers, architects, planners and superintendents. And on state transportation projects, the building trades workforce is protected by Maryland’s prevailing wage law, ensuring adequate pay and benefits. The short-term ripple effects of job creation will combine with long-run returns on improved infrastructure to benefit the state’s economy immensely. And the Governor will enjoy support from both business and labor if he proposes such a plan. 1. If they are truly dedicated to transportation, voters may support them. If they are used to finance “general spending,” voters will be skeptical. 2. Recent declines in gas prices mean that voters will not be hit in their pocketbooks by a gas tax hike. 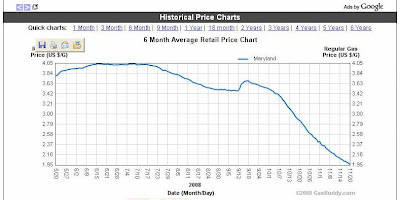 According to Gasbuddy, the average gas price in Maryland has fallen from over $4.00 last summer to less than $2.00 now. Oregon Governor Kulongoski’s two-cent gas hike would amount to less than one-percent of the recent reduction in gas prices if implemented in the Free State. If the gas tax cannot be raised and/or indexed now, when can it ever be increased? Maryland has a transportation crisis. So does Oregon. Oregon’s leadership has a plan to deal with it. We need one too. Update: The Baltimore Sun details the total lack of leadership in Howard County on this issue. Rumors are swirling that Lieutenant Governor Anthony Brown is under consideration by the Obama administration for a cabinet job. If he leaves, what happens next? Governor Martin O’Malley will have to pick a replacement, subject to approval by the General Assembly. And that will be very interesting. Lieutenant Governor picks in the recent past have been made for the sake of regional and demographic ticket-balancing. Of the five statewide officials other than Brown, three (O’Malley and Senators Barbara Mikulski and Ben Cardin) are from the Baltimore area, two (Attorney General Doug Gansler and Comptroller Peter Franchot) are from Montgomery County, four are male and all five are white. That leaves obvious gaps in representation that the Governor will be urged to fill. But this time around, there may be other considerations besides ticket-balancing as the Governor will be the favorite in both the 2010 primary and general elections. Ivey is a highly-regarded prosecutor, even by many in Montgomery County. (That is rare for any Prince George’s politician.) He is particularly praised for trying to rein in the county’s notorious police department and avoiding the appearances of impropriety that have dogged many of the county’s other politicians. Aside from Ivey, Muse may be the most prominent Prince George’s politician not under investigation. By picking Reverend Muse, O’Malley could patch up his relations with black churches in the wake of the slots referendum and deny Prince George’s County to any primary challenger. On the other hand, Muse would generate objections from the GLBT community and he is also rumored to be running for County Executive. Davis is a four-term Delegate and Chair of the Economic Matters Committee at the ripe old age of 41. He is the pick that most resembles Anthony Brown. But would he want to leave his chair and enter a largely ceremonial office for the chance of someday running for Governor? Davis’s departure would give Speaker Mike Busch an interesting choice for his replacement on Economic Matters. Perez has performed excellent work for the Governor in pushing his slots referendum, but he is probably a more likely Obama cabinet pick than is Brown. One thing is for sure: Tom Perez is going places. I know what you’re thinking: why would O’Malley pick another white male politician from the Baltimore area? The logic behind this pick would be to give Smith the full-time job of raising money and making the rounds of the state. Why? That would set him up nicely to take on the Governor’s arch-enemy, Peter Franchot, for Comptroller in 2010. Leggett has several advantages to the Governor aside from demographics. First, he is a former Chair of the Maryland Democratic Party and has relationships across the state. Second, because he will be 69 in 2010, he may have no ambitions for the Governor’s seat and that will make life in Annapolis a bit easier for O’Malley. Third, he can be counted on to be a low-key team member. Fourth, he may be the one Montgomery County politician who is acceptable to the rest of the state. And does Leggett truly want to deal with the next two brutal budget cycles in cash-starved MoCo? Best of all, Leggett’s ascension would set off a chaotic fracas for the County Executive’s chair in Rockville. At least four County Council Members will go for it! Update: I cannot let this discussion pass without reference to Maryland’s most significant Lieutenant Governor choice: William Donald Schaefer’s pick of Melvin Steinberg in 1986. Steinberg, then the President of the Maryland Senate, became embroiled in a feud with the hot-tempered Schaefer and was shut out of all administration duties. After losing to Parris Glendening in the 1994 Governor primary, Steinberg endorsed conservative Ellen Sauerbrey four years later. But none of this makes Steinberg the most important number two pick in the state’s history. What is really important is the identity of Steinberg’s successor as Senate President. You guessed it: Big Daddy Mike Miller. And so out of small acts are empires born! Update 2: The Examiner and the Gazette have more, including speculation that County Council Member Valerie Ervin might get the job. A flatlining economy. Intolerable and worsening traffic congestion. Falling transportation revenues. Maryland has all of these problems. So does Oregon. The difference is that Oregon’s political leadership is doing something about it. Oregon’s transportation system is not currently equipped to respond to the needs of a global economy, increases in population, rising energy costs and the obligation to reduce greenhouse gas emissions, which contribute to climate change. As Oregonians begin to drive fewer miles in more fuel-efficient vehicles, the revenues from the gas tax and related fees will continue to be less than necessary to meet needs. In fact, ODOT predicts that, within the next few years, revenues will decline in real as well as relative terms. This reduction, combined with the rapid increase in the cost of construction, severely limit Oregon’s capability to maintain and preserve existing infrastructure. Further, the economic slowdown the country is facing reduces reso-urces even more. Oregon’s challenge is to find a sustainable way to fund a transportation system that supports a vibrant economy, creates jobs and offers safe, efficient options for travel. Every word of that statement applies equally well to Maryland. A. A dedicated fund for non-highway investments. B. Studying per-mile road user fees like vehicle mile taxes (VMTs). C. Implementing a pilot congestion fee project. D. Creating regional transportation utility commissions to collect and distribute revenues to projects in those regions. E. Implementing variable first-time title fees to give buyers of fuel-efficient vehicles lower rates than buyers of gas guzzlers. F. Providing tax incentives to promote alternative vehicle technologies (like plug-in hybrids). G. Providing incentives for clean diesel technologies. H. Supporting “pay-as-you-drive” insurance policies, which would tie premiums to actual auto use. I. A finance package combining increases in registration fees, title fees and a two-cent gas tax hike resulting in $499 million per year in new funding for transportation. The report estimated the revenue increases would cost motorists $85-265 per year. It also estimated that poor road conditions cost motorists more than $400 per year in additional vehicle maintenance. One of the most important investments we can make during a slow economy is in public works projects, such as transportation... We have a long bipartisan tradition of investing in transportation in good times and in bad times. Building roads, bridges and public transit is good for the economy and our citizens by putting people back to work. Will Oregon’s Governor get his way? Democrats control 18 seats in the 30-seat Senate and 36 seats in the 60-seat House. The legislation should also receive significant business support since the advisory committee included 25 business representatives among its 69 members. So while the package will perhaps be tweaked in the legislature, some version of it may very well become law. And Governor Kulongoski will be hailed by business and labor alike for creating jobs during a recession. So what of Maryland? We will conclude in Part Three. On Election Day, here's what District 20 Delegate Tom Hucker and his supporters were handing out at the precincts. We hear three tidbits about this ballot. 1. The rest of the District 20 Delegation was not told of this ballot prior to Election Day. They found out the same way as the rest of the voters: by seeing it handed out! 2. The ballot names Delegate Hucker as the "District 20 Chair, Maryland for Obama." While there was a Montgomery County for Obama organization, four different Obama volunteers we asked - including three inside District 20 - have never heard of a distinct District 20 organization. 3. The ballots were paid for by the Communications Workers of America (CWA) PAC. CWA donated $4,000 to Delegate Hucker on 8/8/06 and another $500 on 1/4/08. Their payment for these ballots may well constitute an in-kind contribution. And they say my district is a soap opera! Following is a statement from Senator Rich Madaleno (D-18), a member of the Senate's Budget and Taxation Committee, on the state's budget. On Tuesday, the Department of Legislative Services (DLS) briefed the Joint Committee on Spending Affordability concerning the Transportation Trust Fund (TTF) and the state’s capital budget for FY10. Much like the last two Redskins’ games, there were few highlights and the news got worse as time went by. The briefing document is available here. As you may have read in the Post and Sun, the main news from the briefing concerned the TTF. Even after the $1.1 billion in cuts, DLS estimates the trust fund projection for the next six years to be overstated by $2.3 billion. Put another way, the current six year Consolidated Transportation Program assumes a $5.8 billion capital program. The DLS revised projection would suggest the state can only afford a $3.3 billion capital program. This would limit the state to finishing currently under construction projects and then only proceeding with system preservation projects. The briefing on the capital budget focused the Capital Debt Affordability Committee’s action to raise our debt limit from 3.2% to 4% of total statewide personal income. It is the first change in more than three decades. Because of the cuts to the transportation capital plan, we are no longer projected to exceed 3.2% over the next five years. This is good news since it will allow this new policy to be reviewed by the credit rating agencies in the abstract when we next go to the bond markets in February. If the rating agencies question the change, it can be reversed without having to constrain our capital program. This also leaves the state with additional debt capacity if we choose to use it for stimulus. Finally, DLS reported that a small property tax increase (one to two cents) will be necessary over the next two years to avoid having to subsidize debt service with general funds. Our current $0.112 property tax is dedicated to paying debt service. The final piece of bad news concerns the general fund. All indicators suggest that our revenue picture will continue to worsen over the next few months. Data from September indicate that initial claims for unemployment insurance are up 62.6% over the same month last year. Sales tax revenues are down 7.8% for October over last year, and titling tax revenues are down 20%. The chart on page 34 shows that, while the cuts made by the Board of Public Works last month helped, we are still facing a $1.3 billion hole for FY10. Hopefully, Congress will act quickly over the next two months on a rescue plan for the states before Gov. O’Malley has to submit his next budget. It may also be time to seriously consider dipping into the Rainy Day Fund. Please let me know if you have any questions. Have a nice weekend. Due to technical problems in the previous showings, Channel 16 is showing a rebroadcast of my interview on Political Pulse on 11/21, 11/22 and 11/23 (Friday, Saturday and Sunday) at 7:30 PM. Recent indications that Barbara Mikulski is running for reelection and another appointment as chairman of the Democratic Congressional Campaign Committee indicate that Chris Van Hollen is headed for a long and fruitful career in the House of Representatives. It is no secret that Chris Van Hollen has Senate aspirations, despite his decision not to run for the seat left open by Paul Sarbanes’ retirement in 2006. But his work in the House along with the lack of an open Senate seat in 2010 mean there is less and less reason to seek a Senate seat in the future. Van Hollen should continue to focus his energy on the House of Representatives, where he is on the fast track to House leadership and sits on one of the most powerful House Committees, Ways and Means. After declining the 2006 Senate run, Van Hollen immersed himself in his duties as one of Rahm Emanuel’s deputies at the Democratic Congressional Campaign Committee, the political arm of the House Democrats. The DCCC was successful in 2006, giving the Democrats majority control of the House of Representatives for the first time since the 1994 election. Van Hollen was rewarded for his work recruiting candidates around the country with the chairmanship of the DCCC when Emanuel moved into House leadership. The early belief was that Democrats would have difficulty building on their majority. In the 1996 election, two years after their wave election, the Republicans lost two seats. Though the results are not yet final, Democrats managed to increase their majority by at least twenty-three seats. Van Hollen hoped to follow Emanuel’s path and join the House leadership. With Emanuel vacating his leadership post and the House to work for the Obama Administration, Van Hollen considered a run for Caucus Chairman against Caucus Vice-Chair John Larson (CT), but ended up taking a second appointment as DCCC Chair. To make the grueling task of DCCC Chair a little sweeter, the Speaker also carved out a special position for Van Hollen as a liaison between the House of Representatives and the White House. A Speaker created position has the potential to be just a title and relatively meaningless, but given Van Hollen’s close relationship with Emanuel, he may be able to do a lot with it. Perhaps more importantly, each Democrat Van Hollen helps as he travels the country is a potential vote for him in a future leadership race. With hard work, he could even some day replace Maryland Congressman Steny Hoyer as House Majority Leader. Building on majorities is difficult, but not unprecedented. Since the 435-member House came into being after the 1912 election, Democrats have managed to build on existing majorities in three or more elections in the 1930s, 1950s, and 1980s. If Van Hollen succeeds in 2010, his chances of leadership will continue to grow. On the policy side, Van Hollen is also well positioned. He sits on the Oversight and Government Reform Committee, which is important for his district full of federal employees and contractors. But he is also on the prestigious House Ways and Means Committee. He ranks 21st in seniority on the committee, but three of those ahead of him will not be returning in the next Congress and six others are over 70 years old. That means in just a few years Van Hollen could be in striking distance of chairmanship of a subcommittee. Just shy of fifty, Van Hollen can afford to wait a few years. When Ben Cardin decided to run for the Senate, he did not expect Democrats to win a majority in the House. Had Cardin stayed in the House, he would have been chairman of the Trade Subcommittee, part of the Ways and Means Committee, instead of a freshman Senator. Although now in a statewide office, Cardin would have had much more of an impact on policy as a Subcommittee Chair than as a freshman Senator. I actually believe that had Cardin thought the Democrats would retake the House before he launched his Senate campaign, he would have stayed. As the years go by and if Democrats maintain their House majority, Van Hollen should focus his efforts on House leadership and substantive committee work. Leave the Senate for someone else and be a man of the House. Ross Capon became Executive Director of the National Association of Railroad Passengers (NARP) in 1976 and was named President this year. As a co-founder with Harry Sanders of the Action Committee for Transit back in 1986, I had no idea that, 22 years later, there would still be a question about whether to build light rail on the former B&O freight line—and that I would be telling you at this hearing that my oldest son, a Maryland senior and daily commuter, has spent a good part of the last four years on the Beltway. I hope my eight-year-old, should he attend Maryland, will have better public transportation. The Purple Line will bring important travel-choice and environmental benefits. We urge that it be built as rapidly as possible. The Purple Line will enhance the usefulness—and extend the reach of—Metrorail due to connections at Bethesda, Silver Spring, College Park and New Carrollton. We are pleased that the University of Maryland administration has agreed to the right-of-way that the student government pressed for and which will insure maximum usefulness of the service for the university community. Bus Rapid Transit is not the right answer. A GAO study found light rail 15.5% less costly to operate than bus. Vehicle life-cycle costs favor rail. Federal Transit Administration will assist in bus replacements at 12 years, rail vehicles at 25 years (and rail vehicles can operate for 30-35 years). Rail attracts riders by virtue of greater comfort—that is, generally more on-board space per passenger and a smoother ride—and better system identity. Rail also is safer, particularly in bad weather, and more reliable. In a February, 2006, storm, New Jersey Transit shut down its entire bus system but not the light rail lines in Newark and Jersey City. Boston had to remove articulated buses from its Silver Line because they fishtailed dangerously in the snow. Our impression is that Bus Rapid Transit, for the most part, is supported by people who really don’t want anything at all, or whose main goal is to keep transit of any kind off the Georgetown Branch right-of-way in Bethesda, placing it instead on Jones Bridge Road where it will inevitably serve lower passenger volumes. To people (and the Columbia Country Club) who have worked hard against light rail, I recommend a visit to Newton, Massachusetts. I grew up there, on the “wrong side of the tracks” (the former Boston & Albany mainline, now MBTA commuter rail and the Mass Turnpike Extension). However, on the city’s south side, there is the Highland Branch which, in the late 1950s was transformed from a low-frequency diesel railroad to light rail (Riverside branch of MBTA’s Green Line). This service is highly successful and an asset to property values. The line bisects the historic Woodland Gulf Club, founded in 1896. It is a sad commentary on transportation priorities in Maryland that, even today, we are asking whether to build the Purple Line, and holding hearings on cutting MARC train and MTA transit services, and seeing continuing cuts on Ride-On bus service, but construction on the InterCounty Connector moves along. I have asked Maryland DOT, and not received an answer, about how the budget cuts were allocated among the modal administrations, and whether the same percentage cuts were applied to the Highway Administration and the MTA, even though the former is huge and the latter is smaller and more environmentally beneficial. Georgette "Gigi" Godwin has been President and CEO of the Montgomery County Chamber of Commerce since 2006. Good Evening. I am Gigi Godwin, President of the Montgomery County Chamber of Commerce. Thank you for the opportunity to testify tonight in support of the Purple Line. The business community supports those transportation projects that do the most to relieve congestion, promote economic development, and contribute to the long term economic and environmental vibrancy and sustainability of our community. For those reasons, the Montgomery County Chamber of Commerce supports a Light Rail Purple Line. We believe that this is the best long term investment that the Maryland and Federal Transit Administrations could make in our community. A Light Rail Purple Line will provide a reliable, efficient and environmentally sound mode of transportation for our employees, our students and all our citizens. A high quality mode of transportation is a critical component of attracting and retaining high tech employers and high tech jobs. And, finally, a Light Rail Purple Line will provide the missing link in our regional transit connectivity. Therefore, we urge the selection of a Light Rail mode along the Georgetown Branch Alignment as the locally preferred alternative. In order for a new transit system to improve the convenience and connectivity of those who ride it everyday, it must be reliable and efficient. It must provide significant decreases in travel times via car and it must be able to reliably deliver on those promises for decreased travel times. The Light Rail options outlined in the DEIS significantly outperform the Bus Rapid Transit (BRT) options in both reliability and efficiency. Given that both the low and medium BRT systems would use shared lanes and existing roadways, reliability of these systems decrease as traffic continues to increase, with those buses stuck in the same traffic as the cars on the road, offering commuters no incentive to leave their cars and use the Purple Line. Light rail, however, with its faster speeds and dedicated right of way along the Georgetown branch trail, offers significant efficiency AND reliability, with travel times of 9 minutes from Bethesda to Silver Spring as opposed to the 25 minutes the Bus Rapid Transit system would offer. For businesses and their employees, time is money, and the only way these employees will use the system is if they know they can rely on it to get them to their destination, whether it be work, school, or daycare, in a predictable and short period of time. Economic Development along the Purple Line’s East/West corridor will prove to be a major benefit of the transit project. Many stations have been identified as opportunities for economic development including Chevy Chase Lakes, and the Takoma/Langely area, which is part of a joint master plan between Montgomery and Prince George’s Counties. This kind of economic development is consistent with both Montgomery County and State of Maryland Strategy for transit oriented development that creates environmentally friendly pedestrian communities. Light rail is preferable to Bus Rapid Transit because of the fixed investment by government in the infrastructure, which gives potential buyers of property, both business and residential, a confidence that property will continue to appreciate because of proximity to the light rail station. The Purple Line plays a critical role in connecting our region’s outdated transportation system – a system based primarily on assumptions of employee’s work habits and commuter patterns that were true 30 years ago, but have drastically changed in the past three decades. As our economy has changed, so too has our workforce, and the way we work. A purple line light rail link is CRITICAL to ensuring new regional connectivity. This new regional connectivity will allow our community to continue to grow and thrive in our new, diverse, growing economy. Thank you for the opportunity to get the Montgomery County Chamber of Commerce’s comments regarding the AA/DEIS on the record. We look forward to working with the MTA to make this project a reality. At-large County Council Member George Leventhal is a member of the Council's Transportation, Infrastructure, Energy and Environment Committee and is currently serving his second term. • Increased convenience and improved quality of life. • Alternatives to the automobile. A way to get out of traffic. • Access to jobs, shopping, entertainment and education. • Decreased greenhouse gas emissions. • Less dependence on imported petroleum. • Closer links to our great research university, the University of Maryland at College Park. • Protection, enhancement and completion of the Capital Crescent Trail. • Transit-oriented economic development, smart growth and community revitalization inside the Beltway. What other public investment now underway provides so many benefits for the citizens of Montgomery and Prince George’s Counties? We need the Purple Line now. We need to recognize the stiff competition we will face from other parts of the country that are also seeking federal approval for transit projects. We can’t afford to take for granted that there will be a Purple Line. Despite the options under study in the Draft Environmental Impact Statement, the real choice that confronts us is not between rail and bus, or between an at-grade system versus an underground system. Because the competition is so stiff, our choice is between cost-effective light rail and no transit improvement at all. We must unify – Montgomery and Prince George’s Counties, our congressional delegation, our state senators and state delegates, County Executives and County Councils. We must speak with a single voice and make it clear that we want the Purple Line. Because if we don’t, we will end up with nothing at all. And what would that mean? With no transit improvement, travel times between Silver Spring and Bethesda will increase from the current 20 minutes to 35 minutes by 2030. Between Bethesda and College Park, from the current 49 minutes to 81 minutes. Traffic congestion, air pollution and greenhouse gas emissions will all get worse. However, medium investment light rail will make travel times considerably better in 2030 than they are today. From Silver Spring to Bethesda, only 9 minutes. From Bethesda to College Park, only 34 minutes. With concomitant improvements in energy use and greenhouse gas reduction. I want to thank Governor Martin O’Malley, Secretary of Transportation John Porcari, Maryland Transit Administrator Paul Wiedefeld, Project Manager Mike Madden and all the staff who have worked so hard to get us this close to realizing this vision. Mike Madden and his team have held hundreds of community meetings and listened carefully to concerns over alignments, design elements, buffering, landscaping, noise, placement of the trail and many other issues. The DEIS is much better as a result of all the input they have received, and the state’s preferred final alternative will be even better as a result of the testimony they are hearing this month. Legitimate concerns of neighborhoods and trail users are being addressed. Even as we respond to these important, but relatively narrow, issues, we must keep the big picture in mind. We cannot allow valid concerns over details that can be relatively easily addressed to convey a message that we don’t actually support the vision that the Purple Line represents: a vision of improved mobility; a cleaner environment; invigorated, walkable communities; and a beautiful, safe hiker-biker trail. We must not permit a cacophony of disparate voices to suggest that our region doesn’t really know what it wants. We may not have unanimity of opinion. In public policy, unanimity is very rare. But I believe there is a clear, strong and growing consensus in Montgomery County behind light rail on the Master Plan alignment. Based upon the input I have received throughout my years in community activism and elected office, I believe that my constituents overwhelmingly want the Purple Line. They want it to be light rail because they perceive that as a higher-quality commuting experience than bus transit. With a new President taking office in January, Barack Obama, committed to federal investments in infrastructure to stimulate our lagging economy, 2009 will be an extraordinarily opportune time to ask for what we want. And the stronger consensus we have around our preferred option, the better our chances of winning federal funds. If we ask for what we don’t want, we might get it! And if we aren’t clear about what we are asking for, we might get nothing at all. Following is the testimony of Town of Chevy Chase Council Member David Lublin, who is a Professor at American University and is the founder of Maryland Politics Watch. Thank you for the opportunity to speak with you about this important issue today. Many others will speak about the need to protect the Trail—vital green space in a rapidly growing area—and the need for public transit. However, I plan to focus on serious concerns that the Town of Chevy Chase has regarding the ridership and cost estimates in the DEIS. As will be outlined in the Town’s written submission, these estimates seriously underestimate costs and overestimate ridership for the five options on the Trail. At the same time, MTA has failed to optimize the Jones Bridge Road Bus Rapid Transit alignment despite repeated requests from the Town. Changes clearly need to be made if the EIS is to fulfill the legal requirement to optimize all options and estimate costs and ridership accurately. First, we remain concerned that the ridership estimates for the five options on the Trail continue to include riders from beyond the half-mile limit in violation of accepted transportation planning standards despite repeated efforts by the Town to point out this error. In response to enquiries, MTA replied that it had adhered to “the model” but this vague answer suggests that it continues to include riders from outside the appropriate catchment area. Second, the ridership estimates continue to assume a free transfer to Metro and fail to reflect that the cost of the transfer must be borne by either passengers—thus reducing ridership—or by the State—thus increasing operating costs. Again, though the Town has repeatedly pointed out this problem, MTA continues to assume a free transfer even though WMATA’s current practice is to charge for intermodal transfers and FTA requires the analysis to reflect the current practice. In addition, the model fails to follow standard industry practice of including time penalties for transfers. Such penalties account for the amount of time it takes to complete a transfer—including wait time—plus the added inconvenience and anxiety associated with transferring. Third, there are two significant costs to be borne by the County which appear to be outside the Purple Line cost estimates, raisings questions as to the true costs of the Purple Line. One is the $60 million southern elevator connection at Bethesda Metro. MTA fails to include costs for the elevator in its budget for the master plan light-rail options and it is unclear what credit the County will get for providing this needed amenity. Yet, the costs to put a new Metro connection at National Naval Medical Center are included in that alignments’ budget pushing the costs of the Jones Bridge Road option up. The other is the cost for building the Trail–we’ve heard estimates between $12-14 million—which the DEIS states will be borne by the County. Those costs are not easily isolated in the Purple Line budget and it is unclear if the estimated costs include the many long ramps, grading, retaining walls and landscaping in their analysis. The EIS should contain an accurate estimate of costs and benefits and the County should know exactly what it is committing to. Despite MTA’s best efforts to produce favorable numbers for the light rail options on the trail, these options remain like horses which barely qualify for a race and have little chance of finishing in the money—or receiving federal funds. If we really want to move the Purple Line forward, MTA and the EIS need to take a more serious look at the Jones Bridge Road option and to optimize it correctly. The projected growth of the Woodmont Triangle, the BRAC process, and the enormous growth of the National Naval Medical Center make this imperative. MTA has repeatedly explained that it has relied on the accepted Council of Governments model in estimating ridership. However, MTA has amazingly relied on a pre-BRAC version of this model. If the changes caused by BRAC were minor, this wouldn’t matter much. However, BRAC is going to produce enormous increases in traffic. The Purple Line is an ideal opportunity to address this problem by providing a one-seat ride to Medical Center and Bethesda. Yet, MTA has not optimized this option. Unbelievably, MTA’s estimates have the supposedly optimized version of Bus Rapid Transit on Jones Bridge Road running at a slower speed than the slowest local bus on the same road today. MTA also has not done a reasonable study of traffic signal priority for this alternative, which is a key feature of Bus Rapid Transit. Moreover, MTA still has this option taking a slower path than any of the other options east of Jones Mill Road. Finally, the DEIS repeatedly states that the Trail was purchased as a “transitway” and in the Master Plan. Reality is far cloudier. The formerly little-used train right-of-way was purchased as part of the “Rails to Trails” program. The Montgomery County Master Plan calls for a one-lane trolley—not the two-lane light rail proposed by the Purple Line. And the $10 million used to purchase the Trail includes the segments now part of the Capital Crescent Trail between Bethesda and DC. Does MTA claim that this portion of the Trail is also reserved for a future light rail network as well? Thanks again for providing myself and the Town the opportunity to participate in this process. Instead of promoting an option which wrecks two parks—the Capital Crescent Trail and Woodmont Plaza—for the price of one light rail, the EIS needs to reexamine the Jones Bridge Road Bus Rapid Transit option so that we can get two transit lines—the Purple Line and Corridor Cities Transitway—for the price of one. Delegate Al Carr (D-18) was appointed to the House of Delegates in 2007 and is a former member of the Town of Kensington Council. My name is Al Carr. I live in Kensington and I represent the citzens of District 18 in the Maryland House of Delegates. I have been following this debate for nearly twenty years. I support the Purple Line. But I do not agree with those who say that we should limit our options to light rail as the only mode and to the Capital Crescent Trail as the only route. To achieve the best result, we need to make sure that we can think outside the purple box. A true Bus Rapid Transit solution along Jones Bridge Road needs to be added to the alternatives being considered. The newest transit line in North America opened a few weeks ago in Cleveland Ohio where I was born. My son and I plan to ride it next week when we visit grandma for Thanksgiving. Cleveland is no stranger to light rail. Unlike the Washington area, they never dismantled their light rail network. They considered light rail during the planning for their new line. But they ultimately chose bus rapid transit. They found BRT to be an efficient, environmentally friendly way to move people, and to support economic development while being twice as cost effective as light rail. In these times of extreme financial challenge, we need to be prepared for a range of options with a range of price tags. Bus Rapid Transit on Jones Bridge Road is an option that will preserve the Capital Crescent Trail. This is a heavily used, wonderful urban park that brings people together. I don't know how many of the people in this room have actually lived next to a light rail line. Well I have. And I can tell you that there is no better way to forever divide a neighborhood and keep people separated. And that is what will happen if we put light rail on the Capital Crescent Trail. The entire Connecticut Avenue corridor including Kensington has traffic problems that are about to get worse. This corridor suffers from pedestrian fatalities, extreme congestion and dangerous cut through traffic. All of these problems will be made worse by growth at the Naval Hospital due to BRAC and by the added traffic caused by the Intercounty Connector. If we fail to consider Bus Rapid Transit on Jones Bridge Road, we will miss an opportunity to address these problems. And we will continue a pattern of piecemeal transportation planning rather than coordination. Let's not paint ourselves into a purple corner. Let's keep our options open, so that the end result will be a smarter Purple Line. The Maryland State Teachers Association (MSTA) is running this ad in the Baltimore and Washington media markets. The Baltimore Sun has more. Maryland Department of Transportation (MDOT) Secretary John Porcari held his annual Road Show event in Rockville last Thursday. Its purpose is to brief Montgomery lawmakers and constituents on what the state is building in the county. But of course, lots of attention is also directed at what the state is not building. And that means – surprise, surprise – it all comes down to money. From left to right: SHA's Darryl Mobley and Neil Pedersen, Senator Rich Madaleno (D-18), Delegate Brian Feldman (D-15) and MDOT Secretary John Porcari. John Porcari is a considerably more skilled man than his predecessor, Ehrlich Transportation Secretary Bob Flanagan. Flanagan was notorious for saying in barely veiled terms, “You guys are getting the ICC. Isn’t that enough?” Porcari is facing a far more constrained budget situation than Flanagan ever did. Yet, his style is to lay out the budget realities in plain terms, have his aides drone on for very long periods about every state project line by line and artfully deflect the darts thrown by unhappy politicians. 1. There Are Only THREE Road Projects Under Construction by the State in MoCo. You read that correctly: THREE road projects under construction. They are the ever-popular ICC, a 1.1 mile 6-lane highway along MD 124 (Woodfield Road) near Montgomery Village, and the Randolph Road/Montrose Parkway interchange in Rockville. A dozen more projects are in various stages of planning with no construction money scheduled. John Porcari (center) has better political skills than most politicians. The ICC consists of five contracts. Contract A, linking I-370 to Georgia Avenue, is now under construction. Contract C, linking US-29 to I-95, is also under construction. Contract B, linking Georgia Avenue to US-29, has just had a notice to proceed issued. Construction will start in early 2009. Contract E, linking I-95 to US-1 in Prince George’s County, is scheduled to have a notice to proceed issued by the summer of 2009. Contract D, which would build a network of feeder roads around I-95, has been “indefinitely deferred” due to cost overruns on other phases of the project. Just to hammer the point home, State Highway Administrator Neil Pedersen stated “it is not our intention” to replace Contract B with local road work. At this point, 92% of the construction funding has already been awarded. 3. No Worries About the Purple Line or the CCT – Right? Porcari and his staff were adamant that Baltimore’s Red Line, the Purple Line and the Corridor Cities Transitway (CCT) are on parallel tracks for the federal approval process. When challenged by Delegate Charles Barkley (D-39), Porcari said that the recent planning cuts ($25 million for the Purple Line and $43 million for the CCT) would not affect the readiness of those projects for federal review. No one asked the obvious question: if those amounts were unnecessary, what were they doing in the budget in the first place? Nancy Floreen calls the question - again. But County Council Member Nancy Floreen asked the question of the night. When would Montgomery County be told of its expected “local contribution” for either of the two transit projects? This pulls the pants down on a dirty secret not commonly reported in the press. When the federal government and the state decide how much funding they will channel to any of the state’s three competing transit projects (assuming that any are federally approved), the local jurisdiction will be expected to make up any difference with project cost. Porcari’s staff could not provide an answer on when those costs would be known, but estimated they might be available in two years. The discussion of the two major transit projects has always assumed they would be mostly paid by the federal government and the state. But what if a large bill is headed to the county? How much will county taxpayers be willing to pay for the Purple Line or the CCT? What if the property tax limit has to be broken, thus triggering the anti-tax Ficker Amendment? There are many issues awaiting the County Council and the voters in years to come. Senator Brian Frosh (D-16) asks about BRAC. The Road Show was well attended by the Montgomery Delegation and many of them questioned Porcari and his staff. But the bottom line still comes down to money. During the special session, the General Assembly raised enough transportation funding to pay for $150 million in new projects and $250 million in additional system preservation. But the economic collapse and the diversion of $50 million to pay for repealing the computer tax have depressed revenues to the point that the state is only receiving $265 million in new money – almost all of which is scheduled for maintenance. Had the legislature listened to the Montgomery County Chamber of Commerce and raised $600 million for transportation, projects such as BRAC might be better funded. If the county’s state legislators are truly interested in moving these projects along, complaints to Secretary Porcari will not suffice. The only way to make progress is to raise more transportation funding. Show us the money!